Elisabeth and David Gelzer, 1977. David Gelzer, Presbyterian missionary, theological educator, and friend of the Presbyterian Historical Society, died on January 23, 2016 . David Georg Gelzer was born in Vevey, Switzerland, the third of eight children of a Swiss Reformed minister, and grew up in Basel, in an extended family of bankers, scholars, and clergymen. He emigrated alone to the United States, with no grasp of English, as a seventeen year old, sponsored by a distant cousin with a farm in Indiana. He graduated from the University of Dubuque in 1941, and from Dubuque Theological Seminary in 1943, was ordained, and undertook doctoral work at Yale Divinity School. David left Yale in 1946 for the College of Idaho in Caldwell, where he taught German and religion, and met Elisabeth Bennet (1920-2014). The couple were married in 1949, and in 1952 were appointed missionaries to Cameroon by the Board of Foreign Missions of the Presbyterian Church in the U.S.A., assigned to the newly-formed Collège Évangélique de Libamba. Libamba was a center of the armed struggle against French colonialism, and here David first made clear his material support for the causes of justice and peace, supporting Cameroonian independence, while at the same time keeping arms out of the hands of rebels. The Gelzers stored the Collège's supply of dynamite in their kitchen pantry for a time before surreptitiously dumping it in the Nyong River. David Gelzer and friends, n.d. In addition to work in Libamba, in 1960 David joined the Faculté de Théologie Protestante de Yaoundé and the Gelzer family moved to what they recall as "an African echo of the Basel Missionshaus." David worked as a pastor, a prison chaplain, and a radio broadcaster; he was a delegate to the World Alliance of Reformed Churches and the World Council of Churches. On furlough in the United States in the summer of 1964, David spent two weeks registering African-American voters in Mississippi. 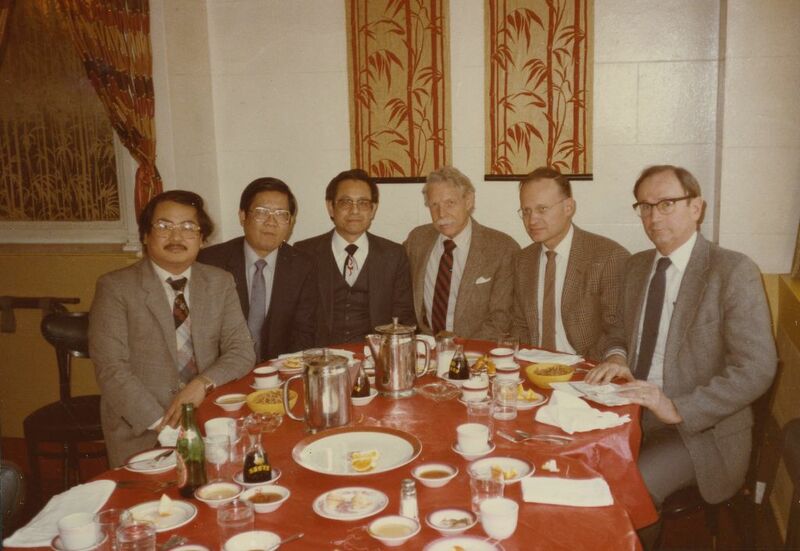 In 1974, he left the deanship of Yaoundé, and the next year was invited to Tainan Theological College in Taiwan. Once more caught up in a struggle for liberation, David and Elisabeth hid banned books disguised as Christmas presents on behalf of student democracy activists. As David noted in our Living History interview , "the Kuomintang imposed the same restrictions which the communists had on the mainland." The Gelzers were expelled from Taiwan as subversives in 1984. Given his gift for nurturing new seminaries, David was invited to the faculty of Aulua Theological Seminary in Vanuatu, serving there from 1985 to 1989. 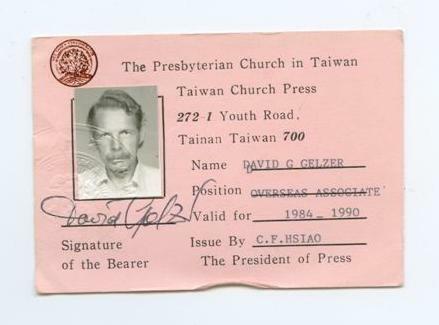 David Gelzer press pass, Taiwan, circa 1984. In retirement from mission work, Dr. Gelzer and Elisabeth volunteered at PHS, sorting, weeding, foldering, and inventorying records of the Commission on Ecumenical Mission and Relations (COEMAR) mission work in Ethiopia, Cameroon, Sudan, and Pakistan. He insisted on being called by his first name, and rarely was. He worked with a small desk lamp and an Apple laptop, and he labeled folders in a precise all-capital script, using a clear plastic metric ruler as a guide. For his years of dedicated work, his collegiality, and his support of PHS and its mission, we give thanks. We are also honored to serve as the repository for David’s papers, which document his long career as a missionary and educator. A service of Witness to the Resurrection will be held at Swarthmore Presbyterian Church  on February 20, 2:30 p.m.